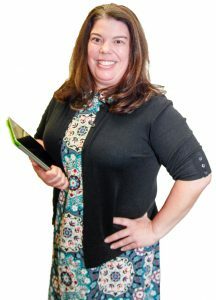 Melissa Kempski is the 2017 PBS Digital Innovator for Michigan. The K-5 technology and library specialist in Lake Orion was recognized for integrating digital media and resources into classrooms in a “bold and fresh” way to spark students’ love of learning. What’s an example of connecting technology to the curriculum? We’ve been using Bloxels on the iPad with a fourth-grade class where they created a video game that connected all of the different characters to the food chain, and then the kids could play each other’s games. That project blended digital learning with the fourth-grade science curriculum. What opportunities does digital learning bring to the classroom? What advice do you give to educators who are learning how to incorporate digital tools? Technology is ever-evolving, but you don’t need to be an expert at everything. My advice for teachers is to find one tool they like and then find multiple ways to use it. That way they get a grasp on that piece of technology and things start to come a bit more second-nature. That’s good advice because it’s less intimidating to wade in to a pond than an ocean, right? Isn’t there a certain amount of experimentation required? Absolutely. A couple years ago, a fifth-grade teacher, myself, and a first-grade teacher decided to do a project with Minecraft. We knew nothing about Minecraft, so we played with it, but then we called an expert: a fourteen-year-old boy. We had the students build a mini economy in Minecraft that hit all kinds of social studies curriculum standards, but we had to be willing to ask the kids for help. That was an incredible experience, and the kids have never forgotten it. What are some of the best digital tools you recommend that teachers try? Google Drive and Microsoft OneDrive are great ways for teachers to collaborate with students—even in another school or another state. So these documents or presentations can have multiple authors across the globe, and that’s so powerful. For formative assessment, I like Plickers and Kahoot—just quick tools teachers can use to gauge where kids are at in their learning. Plickers uses cards that students hold up, which the teacher scans with an iPad, so it’s a solution for schools where there’s not enough technology. You just need one iPad. Do you think technology increases student engagement? I rarely have behavior issues when we’re using technology because they want to do their best. We’ve been using Seesaw, which is a digital portfolio, so whatever we do at school on the iPad or computer can be uploaded, and our parents can see their kids’ work and make comments. Do you hear back from parents? I do. I like that Seesaw archives things, so if you continue to use it from kindergarten up, you’ve got this wonderful documentation of a student’s progress. I hear back from parents who love that they were able to share it with grandparents who live in Florida. It makes the world smaller.